After today's update to April 2018 (17134.81) Enpass PM stops working regularly without any interactions. Something new in the latest version? 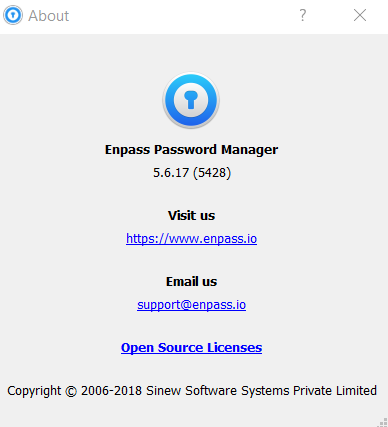 Enpass was updated on 22/5 with no problems the following days. This morning Cumulative Update W10 1803 KB4103729 was installed on my PC. My guess is that it's related to this. Enpass PM stops working regularly without any interactions﻿. Yep, crashes out of the blue. Really annoying, no let's call this blocking! I just keep feeding the information queue. Enpass now really crashes a lot. That is with or without having entered the master password. Sorry for the mess you're going through. I can only wonder how annoying this must be. We're looking into this issue as a high priority. 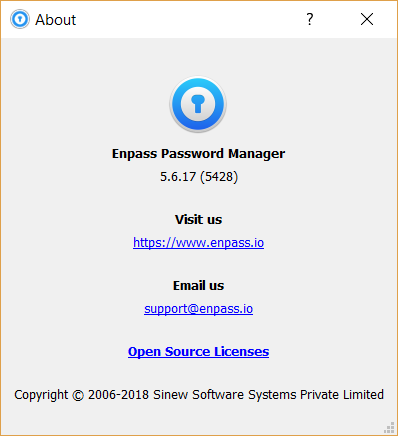 It'd be a great help if you can try installing the traditional desktop version of Enpass from our website and let me know if the same happens there too. 1 more user seeing the same issue of 5.6.17 (5428) crashing with no interaction, shortly after starting the app. Running on latest Windows 10 cumulative update. Like others, had also just recently installed KB4100403 (https://support.microsoft.com/en-au/help/4100403/windows-10-update-kb4100403) and rebooted about 8 hours prior. All the crashes occurred with zero interaction. Hopefully the 5.6.9 build mentioned earlier in this thread solves the issue and can be pushed through the Microsoft (Windows) Store A.S.A.P.! Interestingly, the problem is NOT occurring on the latest RS5 Insider build released today (17677). Something with the latest update for 17134.81. I'll try to unistall the windows store version to install the one from the web site. Same issue here with latest version on Windows 10 1803 on latest update. How it crashes is also inconsistent. Sometimes it outright closes and crash with the message, and sometimes message just pops up with the program window unaffected. I can just put the error message to the side and continue using the program without any issue, but as soon as I click on "OK" button on the error message the whole program closes itself. On further investigating the issue we concluded that the crashes were prominent when using Enpass with " Windows 10 x64 1803 (17134.81)". So please update the latest preview OS build(17677) or either use a stable version of OS and let me know if the problem persists. So when you suggest us to use a stable version of windows, you want us to go back to a previous version ??? Or to use a preview version as an insider ? Do you intend to fix that bug with the lastest stable version of windows 10 ? Because just saying to use a different build of windows isn't helping... nore insinuating that Windows 10 x64 1803 (17134.81) isn't a stable build ! Well, we admit there’s been a delay from our side but we assure you that all our team is burning the candles from both ends for Enpass 6 and we believe that at the same development-pace, the beta version would be available by the end of May 2018. Hi. 17134.81 _IS_ the latest stable version of Windows 10 1803 with the 2018-05 updates. I hope you can get this fixed ASAP. The frequent crashes are very inconvenient. The issue continues, even after I've re-installed the enpass app, and made sure I'm on the latest stable build available from Windows. Well, leaving the app running is not a total solution. It took longer than usual, but eventually stopped working. I hope that a solution can be found, or another update corrects the problem. My prior report of crashing was on a Lenovo T480 laptop running latest version of Windows 10 Pro. 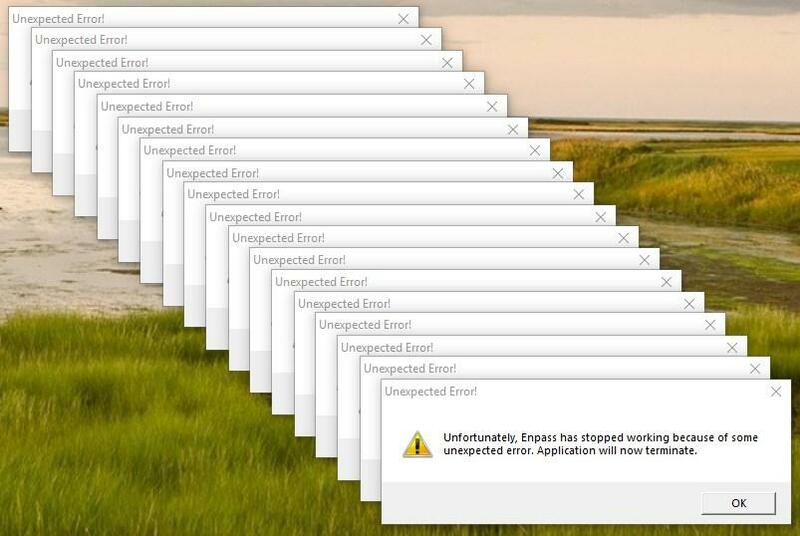 PLEASE ACKNOWLEDGE AND ADDRESS THIS CRITICAL ENPASS WINDOWS DESKTOP ISSUE! ! ! ! It's been crashing on my since the most recent update (pushed via the bridged win32 Windows Store app) within about 10 seconds of launch. It appears that, perhaps, disabling password sync via webdav/owncloud prevents the crash. Can anyone else verify? Dying even with sync turned off. I give up. I'm seeing same problem. Although I have seen it at various times, I notice it happens most consistently as I come out of hibernation. Don't know if this helps but windows event viewer logs show following. You probably already have all this or it contains nothing terribly useful but thought I would post just in case. Come on Enpass team - your handling of this issue is pathetic. Surely it is not hard for you to look up a build number of Windows and see that it is a release build and not a preview build. So many reports of this issue here and on your Twitter feed and yet the ONLY feedback you have given is "Try uninstalling Store app and install MSI version from Enpass website". Pick up your game guys! In a post on the Windows 10 Universal app thread, someone suggested disabling the Edge extension as a fix ... so far that seems to be working for me.